WASHINGTON, D.C., APRIL 1 – A U.S. State Department cable published Friday by whistleblower website WikiLeaks has exposed the true identity of a former Arcata man whom many in the sleepy college town had taken to be nothing more than a hopeless but loveable vagrant-alcoholic. A familiar sight on the streets of Arcata throughout the 1990s and 2000s, “Ragman Pete” was known as much for his distinctive rag attire as his frequent trips to the drunk tank. 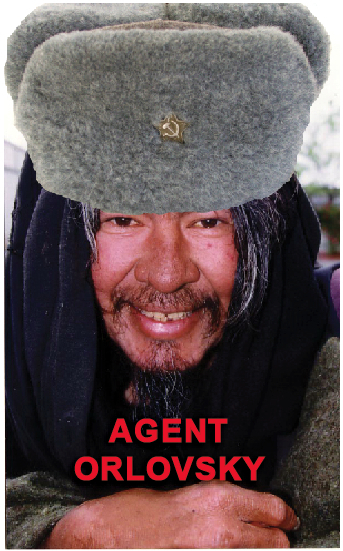 In fact, ostensible homeless dude “Pete Villarreal” was a false identity carefully fabricated by a high-level Russian spy agency, according to the classified cable. Code-named “Silly Monkey,” the cable reveals that it was Orlovsky’s mission to blend-in to a liberal West Coast college town. Among Orlovsky’s assignments was intelligence-gathering on a progressive-leaning academic populace – namely Arcata – apparently viewed within the Kremlin as being “a near-ideal expression of the communist blueprint,” the cable says. Arcata, population 16,500, is widely held to be among the more liberal enclaves on the West Coast. While forbidden by Moscow officialdom from discussing the findings of his 20-year Arcata sojourn, Orlovsky said playing the down-on-his-luck street-dweller was not without its fringe benefits. “I go to many keg-drinking celebration,” he said, recalling one especially memorable evening partying with the HSU female Crew team. The State Department cable goes on to finger Orlovsky’s prominent roles in the failure of New Coke, the Star Wars prequel disasters and the assassination of several South American dignitaries. This entry was posted on Friday, April 1st, 2011 at 11:28 pm	and is filed under News. You can follow any responses to this entry through the RSS 2.0 feed.